Within the last thirty plus years, there have been many books written by the Christian book publishing industry. A recent search for the words “mark of the beast” on the Amazon.com website came back with 8,371 related “hits”. We are talking about hundreds if not thousands of books that deal with this subject. Do you remember Hal Lindsey’s book “The Late Great Planet Earth”? It was a best-seller from the 1970s. This non-fiction book of the 1970’s sold millions of copies. Anyone familiar with Hal Lindsey’s timetable will remember that “the end” would happen before December 31st, 1988. Of course, these publishers are counting on people not remembering or not even knowing of past failed predictions. Where does the Bible mention a “cashless society”? Well, some believe that Revelation 13:17 indicates just that. But how does Revelation 13:17 translate to a cashless society? The word “mark” is the key to the buying and selling transaction. Nothing is said about what the people are using to buy or sell. It just says that they can’t buy or sell without the “mark,” and the mark has to be 666 on the forehead or right hand. Of course, it doesn’t say anything about an embedded microchip. Now let’s keep reading. Skip down to Revelation 14:1. Let me ask a question. 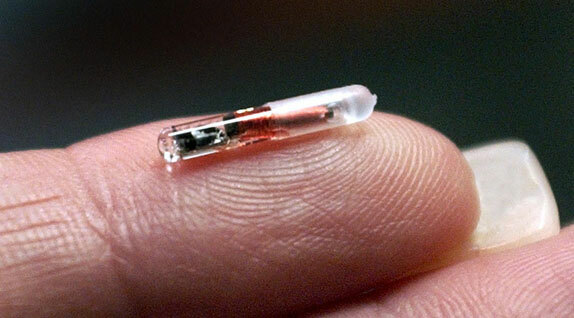 If it’s a microchip in Revelation chapter 13, then wouldn’t it follow that it’s a microchip in Revelation 14:1? The meaning of Revelation 13:17 has to be found in the context that it’s given. Like much of book of Revelation, its familiar symbols are meant to represent familiar concepts to its first century A.D. readers. Remember that it was John, the Apostle who wrote the book of Revelation to the seven Churches that were in Asia. These were actual Churches that existed in his day. The book of Revelation and the entire Bible must be read against the backdrop of the Old Testament and its contemporary historical context. The book of Revelation can be considered the most thoroughly Jewish in its language and imagery of any New Testament book. Revelation speaks not the language of Paul, but of the Old Testament prophets Isaiah, Ezekiel, and Daniel. The beasts, both of the sea and land, the mark on the hand or head, and the number 666 should be interpreted in light of other Old Testament writings. Is Revelation 13:17 the only place in the Bible that mentions the number 666? Well no it isn’t. It’s interesting that in 1 Kings 10:14 the same number is given listing the weight of gold that came to Solomon in one year as the number of the beast in Revelation 13:1: “Now the weight of gold that came to Solomon in one year was six hundred threescore and six talents of gold.” Also in Ezra 2:13 a mention is made of Adonikam who had 666 children! Who was Adonikam? Well, he was sent by the King of Persia from Babylon to Jerusalem to rebuild the temple. By the way, Adonikam means “lord of rising”. These 666 children of Adonikam were those of his household who returned to Jerusalem to rebuild the Temple and reverse the curse. Not exactly a negative thing wouldn’t you say? The “Mark” in these scriptures is not physical but spiritual. It’s a “mark” that’s in the thoughts and intents of the heart. A correct interpretation of the Bible will always be consistent with the rest of the Scriptures. Therefore, it is essential for us as students of the Bible to interpret a passage in light of what the rest of the Scriptures say about the topic. Whoever carried the “mark of the beast” would be identified as someone who aligned himself with the beast. And whoever carried the mark of the Lamb would be identified with the blood and seal of the Lamb (Rev. 14:1). We see that in Revelation 14:1 and 14:4 that those who carried the name of Jesus’ Father “written on their foreheads . . . follow the Lamb wherever He goes” (Rev. 14:1, 4). History tells us that those who identified with Rome against Jesus Christ died in the destruction of Jerusalem when Titus and his army swept in to destroy the temple and the city. Could it be that these are the ones who drank “of the wine of the wrath of God” (Rev. 14:10)? The two “marks” identified two different groups of people: one for Christ and one against Christ. This theme of two opposing groups is seen as far back as Genesis. Take a look at Genesis 3:15. The “Mark of Cain” was a result not so much of murder but the result of a spiritual battle. It was a battle between true and false worship. It was a battle about what was an acceptable sacrifice. God demanded a blood sacrifice, but Cain refused to provide one. Cain refused to follow the righteousness of God, instead following his own righteous. He wanted to do Church his way. I don’t think Revelation 13:17–18 is about economics. It’s not about “buying and selling” actual goods. It’s not about “buying and selling” stuff but about “buying and selling” spiritual things. The control of economic transactions drives modern claims of a one-world government, controlled by ” “The Antichrist” during a period referred to as the “great tribulation.” It’s the popular Christian view. It’s the view presented in best selling Christian books. But I don’t agree that this is the view of the Bible. In fact, Revelation 13:16–17 does not describe the control of financial transactions, but rather access to the temple controlled by the Jewish anti-Christian religious establishment. The key to interpreting the passage is the prohibition “to buy or to sell” (Rev. 13:17) if a worshiper does not have the “mark of the beast.” Buying and selling, when properly understood, are worship-related rituals (Isa. 55:1–2). Early in the church’s history the Christian disciples went to the Jewish temple to preach the gospel. Let’s go to the book of Acts to see what happened to them. At first, these new believers in Jesus Christ were welcomed. Later they would be thrown out of the Temple and even imprisoned. Peter and John frequented the Temple during “the hour of prayer” (Acts 3:1). Jewish Christians continued to use the temple, even participating in some of its rituals such as purification in Acts 21:26. After the temple officials had learned that these Jews were preaching that Jesus was the Messiah, the Lamb of God who takes away the sin of the world, Paul was “dragged . . . out of the temple; and immediately the doors were shut” (Acts 21:27–31). Jesus tells the church at Laodicea, “I advise you to buy of Me gold tried in the fire, that thou mayest be rich. . ” (Rev. 3:18). How were the people to buy gold from God? Buying gold refined by fire is symbolic and relates to spiritual worship. It is reasonable, therefore, to assume that the reference to “buying & selling” in Revelation 13:17 is also symbolic and related to worship. The interpretive background for understanding Revelation 13:17 can be found in the gospels. During Jesus’ ministry, the temple officials were “selling,” and worshipers were “buying,” access to the temple (Matthew 21:12). Doves were what the poor bought and offered as a sacrifice. The Priests, who were responsible for the temple, had rented out sections in the outer courts of the temple where greedy and irreligious merchants made a gain of the poor pious worshipers. Their “buying and selling” turned “God’s house” into a “robbers’ den” a “synagogue of Satan” (Revelation 2:9; 3:9). Only those Jews who aligned themselves with the priests, the sacrificial system, and the temple buildings were allowed to enter the temple for worship. If anyone did not have the “mark of the beast”, that is, if they did not align themselves with what the temple now represented apart from Christ, they could not “buy or sell” in order to offer the appropriate sacrifices. To take the “mark of the beast” meant a person denied that Jesus was the Messiah, the true temple of God, the only sufficient sacrifice. Of course, Christian Jews avoided the “mark of the beast” and showed their true allegiance to Jesus. They had “His name and the name of his father written on their foreheads” (Revelation 14:1). They did this through public professions of faith and allegiance to Jesus over against the corrupt priesthood that had chosen Caesar over Christ. This “rage” only intensified as Jews made their decisions regarding Jesus more resolute. Revelation 13 and 14 contrast two ways of salvation: access to the stone temple through the “mark of the beast” (Rev. 11:1–2) or through Jesus Christ, the true temple (John 2:13–25) and the “mark of the Lamb” (Rev. 14:1). Most professing Christians are still looking for the coming of “the antichrist” and the “mark of the beast”. But the Bible teaches that there are many antichrists, even in John’s day. Let me that just say it as plainly as I can? The Christ rejecters, the mockers and the scorners have already taken the “mark of the beast” They have cut themselves off from God’s grace and mercy. There are two marks representing two spiritual systems and two systems of worship. Some have speculated that the 666 are the number of false gods that you might worship. We may very well see the day when we will see a cashless society. A day when computer chips will be inserted under our skin. However, something far worse could happen to us in the meantime. We could go thru life without the “mark of the Lamb” in our foreheads. When we have the “mark of the Lamb”, our center of power will also be under his control. Our thoughts and actions will be Christ-centered. We can worship at the stone temples of false religions, or we can become the temple of the Holy Ghost. We all have a choice between religion or relationship. We all have a choice between true worship and false worship. If you’re wondering about when the “mark of the beast” will be given, well Christ rejecters, scoffers, and those who have pleasure in unrighteous have already taken the mark. God has turned them over to a reprobate mind that they would believe a lie and be damned. Thanks for an interesting post. Where you find Revelation the most Jewish of New Testament books, D. H. Lawrence (literary giant of early modernism) found it to be the most pagan. For a fascinating critique of Revelation, see his short book Apocalypse, which can be read in 2 or 3 hours. He takes an anti-Christian stance, but has mixed feelings about Revelation, appreciating the pagan imagery but rejecting the arc of the Christian narrative, which seems too destructive of the sensual world for Lawrence’s taste. Gary – thanks for visiting our website and taking the time to post a comment on the “Mark of the Beast” article. My comment regarding the book of Revelation was an attempt to point out that it was written in a style very different from the rest of the New Testament books. Would you agree that Revelation belongs to a class of chiefly Jewish literature called “apocalyptic”? Apocalyptic, as you are probably aware, refers, in a broad sense to a group of books written between 200 B.C. and A.D. 100. Apocalyptic writings usually had certain characteristics in common. Writers generally claimed that a divine disclosure had been given through an angelic intermediary. God’s secret purpose was said to have been revealed through a dream or vision in the heavenly realm. These apocalyptic writings claimed to reveal God’s purpose in history. These writings tried to explain why the Jews, who thought of themselves as God’s people, were part of an oppressed nation suffering under ungodly political institutions. The thought and content of apocalyptic was based on themes in the Hebrew Scriptures, the Old Testament. Even non-Jewish Christians with no prior contact with Judaism would have recognized the apocalyptic form, because it was used among other peoples as well. John helped his readers understand what to expect by calling his work, “The Revelation of Jesus Christ….”(1:1). The first words of the book identifies its general purpose and content: The book will reveal the purpose of God in history for his people and explain their situation in the world, as well as their glorious future. In regards to D. H. Lawrence and his critique of Revelation, I will have to say that I am not familiar with the work you cited. But thanks for the recommendation – I’ll have to check it out. However, Mr. Lawrence is not the only writer who has written a critique on Revelation. I highly recommend David Chilton’s book “The Days of Vengeance: An Exposition of the Book of Revelation”. It is a detailed sentence by sentence commentary on Revelation. John wrote Revelation as a coded message to 1st century A.D. Christians. Chilton does an excellent job (in my opinion) of deciphering the code! I have no particular expertise on the subject, but yes, I’ve thought of it as part of the (more or less) Jewish apocalyptic tradition. The Chilton book sounds interesting. Thanks. Another good book that is on my “to read” list is by Kenneth L. Gentry entitled “Before Jerusalem Fell: Dating the Book of Revelation”. Both Chilton and Gentry are in the camp that believe that the book of Revelation was written before the destruction of the Jewish Temple in A.D. 70. They seek to prove that Revelation was prophesying that event. Gentry makes his case for this early date of Revelation by providing both internal evidence from within Revelation and external evidence from Church history and tradition. It provides much exposition of the text of Revelation. A large part of the argument deals with the identity of the beast (666) as Nero Caesar, the first imperial persecutor of the Church. This interpretation of Revelation puts the destruction of the Jewish Temple not as a future event but as a past event that occurred in A.D. 70 when the Roman army encompassed the city and took it by siege. I’m sure this probably was not the view that D. H. Lawrence took when he wrote his critique of Revelation.